Ramblings of a Daydreamer: Gail Vaz-Oxlade & my first-ever book signing! Gail Vaz-Oxlade & my first-ever book signing! 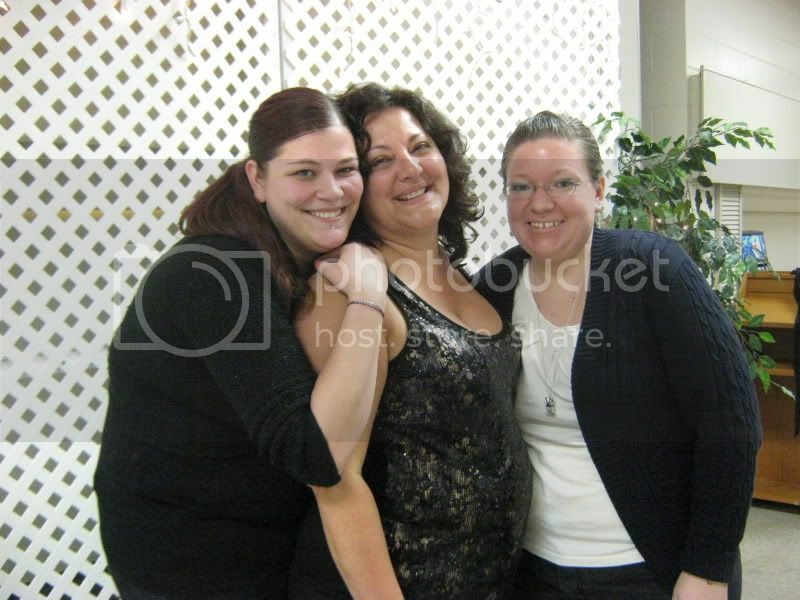 On Saturday, my sister-in-law, Amanda, and I went to meet Gail Vaz-Oxlade. If you don’t know who Gail is - where have you been?! But, no, really, I don’t know if her shows only air in Canada, so…Gail is a financial expert and the host of Till Debt Do Us Part and Princess, and she’s a best-selling author. Have money issues and need help? Gail’s the one to look to for advice. I’ve been watching Till Debt for a couple of years, and I’ve watched Princess since it started last year. I have this obsession with reality TV. I guess part of it is because I’m a writer and I’m fascinated with real life people and situations, but in the case of Gail’s shows, it’s also just because I love her. She’s blunt and honest and tells it like it is, but you can tell that she’s got a soft and kind heart, and I love that about her. So, one day, Amanda and I were out shopping, and I don’t know how we got on the subject, but we discovered that we both watch Gail. One of the first things we both said was that we wanted to meet her someday and hug her. Random, right? 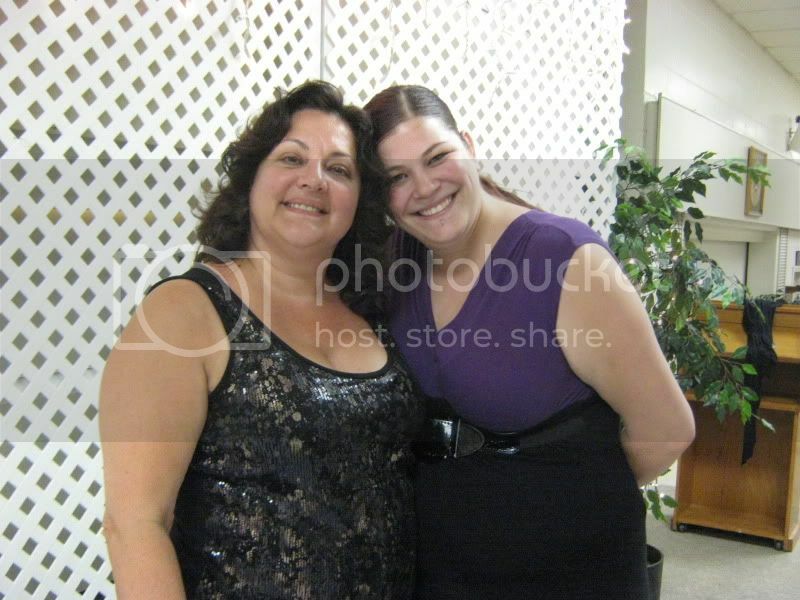 There’s just something so huggable about her, and we thought it was funny that we both thought the same thing. Just a few weeks later, Amanda messaged me all excited to tell me that Gail was going to be in Cobourg, less than an hour away from here, and that tickets were only $25. I was super excited because I’d finally get to meet Gail, plus it would be my first ever book signing! I’m so envious of all my blog buddies who get to go to all these amazing book signings, and I’d never been to a single one. So we set out Saturday morning, doors of the Lion’s Club opened at 11:30, and we got seats at a table right next to where Gail would be sitting, close to the stage. We made friends with a couple of women, Chrissy and Lynne, who were from 2-3 hours away (Amanda and I have this weird habit of making friends when we go places…when we went to see U2 in July, we met a couple of girls from out west, spent the entire day in line with them, they helped us get into the 3rd row of the pit, and I still talk to one of them on a daily basis via text…and yet normally I have trouble making friends because I’m shy and basically a hermit. Go figure). Anyway, Amanda and the two other girls went to check out the books while I kept our table, and a minute later, I heard someone say, ‘Hi Gail’, and there she was walking behind me. I have to admit, I had a fangirl moment…and of course, I was sitting by myself, so I had to try to contain it! Lunch was terrific. From what I’ve heard of some events that include lunch, I was expecting something lame, but there was chicken pot pie, two different kinds of quiche, salad, a pickle and olive tray, a veggie tray, buns, a ton of desserts, and all kinds of drinks. It was really nice, and I was really impressed. Being just a few feet away from Gail, the four of us kept an eye on her, snapped some pictures, and basically eavesdropped on the conversations she was having with the lucky people who got to sit with her. The presentation Gail gave was amazing. She was really funny and engaging - she moved around the stage, made eye contact with people in the crowd, asked questions, explained things. The name of the talk was How to be a Woman of Independent Means, so she talked a lot about what women need to do to ensure we’re taken care of without having to rely on men or anyone else. The Q&A time was really helpful, and she did a fantastic job of answering peoples’ questions in a way that was easy to understand. Also, during her talk, she decided to auction off her shoes - literally the shoes off her feet, these amazing red pumps - and Amanda and Chrissy got into a bidding war, with Chrissy winning at $100. She’s going to auction them off at work and donate the money to a good cause - isn’t that amazing? The shoes Gail was wearing, that Chrissy won in the auction, along with the books Amanda bought to have signed. Next came the book signing. Amanda ran to get in line, so we didn’t have long to wait. 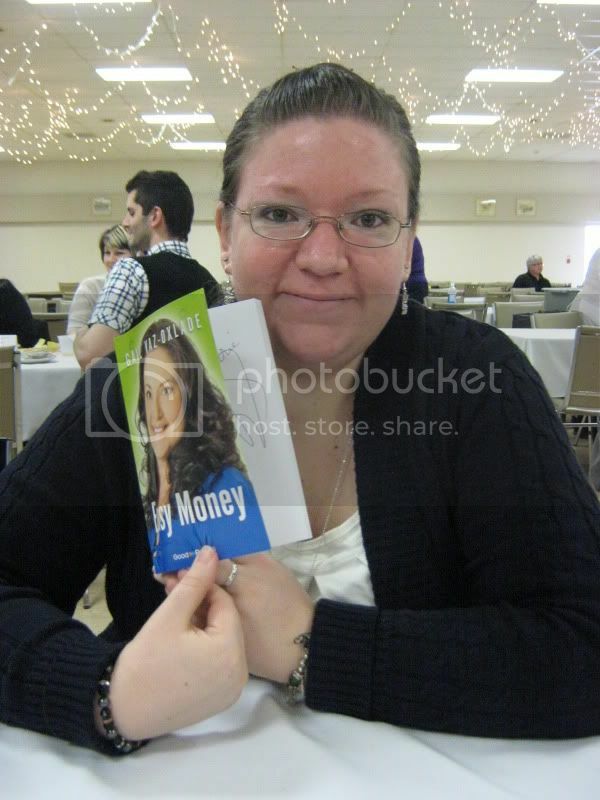 The whole event was a fundraiser for the Northumberland Services for Women, so people who asked questions had to donate $2, and when you went up for the book signing, you could donate $2 for a hug and $2 for a picture with Gail. I thought that was a great idea, and those jars were filling up fast with change! Amanda and I got our wish - we both got to hug Gail, and she gives great hugs! Real, genuine, long-lost best friend hugs. She was so sweet to me…this may sound strange, but I got the impression she could tell I was shy (especially next to Amanda, who’s really flamboyant and loud and extroverted and caught Gail’s attention several times during lunch and the presentation), and she was so incredibly nice to me. Now I love her even more! After we got our books signed, got hugs pictures, we rejoined Chrissy (who was gathering all her things to be signed - books, a poster, and the shoes she won) and Lynn, then got into line with Chrissy so we could take pictures of Gail signing the shoes. 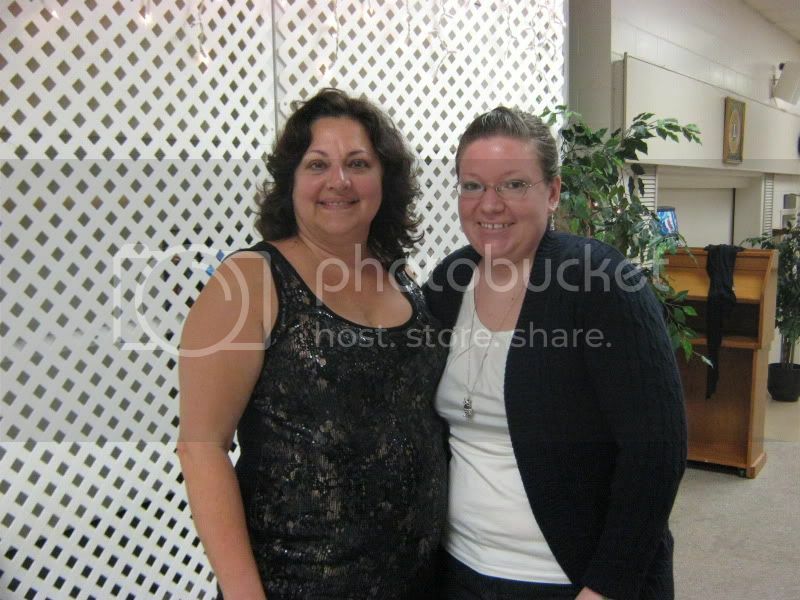 Amanda and I decided to donate another $2 for a group picture, since we took individual pictures with Gail before, and Amanda was allowed to pull Gail aside and ask a private debt-related question. 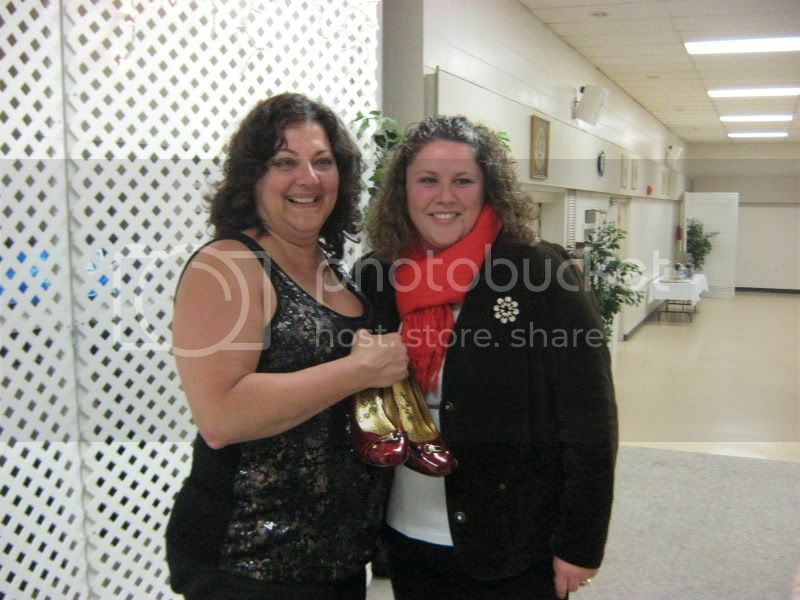 Gail and Chrissy after Gail signed the shoes...my question now is: did Gail go home in her bare feet? It was a really fantastic day. I’m so excited to not only say that I finally got to meet someone I admire and respect immensely (and who I see every day on TV...I see her more than I see most of my friends), but also that I finally went to a book signing! I’ve been a book blogger for almost a year now, so it’s about damn time! Me with my signed book! I haven't done an IMM post or vlog in about a month, so I'll try to do one this week and include this. Now, how about you guys? Do you know who Gail is? Have you ever been to a book signing? Did you turn into a squeeing fangirl or boy? As book bloggers, I know a lot of us can agree that authors are like our rock stars, so I know I'm not the only one! I love Gail Vaz-Oxlade. She is full of great advice, and delivers it in such a no-nonsense way that people have to listen to. I have never been to a book signing, but I would definitely love to go to one.